Private, cool and quiet Mililani Mauka. Professionally landscaped with tropical flowers, plants and an extraordinary running waterfall. Additional exterior features include a two car garage, sprinkler system, a covered BBQ patio and a storage shed. The interior includes an open floor plan with upgraded tile, granite and wood laminate flooring. High ceilings, custom light fixtures, office nook, pre-wired for surround sound and included kitchen appliances are just a few of the comforts offered with this home. 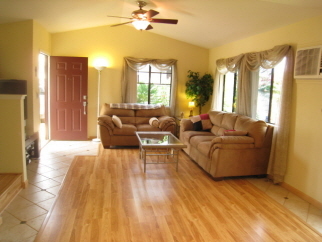 Located just around the corner from Mililani Iki Elementary and close to parks and recreation areas.